Beer Nerd Details: 7% ABV (allegedly) bottled (500 ml waxed cap). Drank out of a flute glass on 12/31/14. Merry new year to me. Oh look, the original batch of Emptiness, Out of the Emptiness (made with plums) has a new batch coming out. Dammit, when will this Believer's Club thing kick in? It's going to be cold on Sunday. According to the Gregorian calendar, the earth has completed yet another orbit around the sun, and thus Earthlings like myself are prone to reflect on the previous orbital period or somesuch. I had a weird year in beer, in some ways it's a natural progression, in other ways, I've regressed. Depending on your point of view, I guess. Regardless, the usual categories of musings I cover every year in a post like this (See 2013, 2012, and 2011 musings) have been mildly stagnant this year. On the other hand, that's probably a good thing. So here's some musings for 2014 and because I like arbitrary exercises and I seem to do it every year, a top 40 list. Taking a Break - I took a break from drinking beer (er, mostly) in March and April of 2014, which was actually a very enjoyable experience. I spent some time with other libations and even some non-alcoholic beverages (the horror!) I plan on doing the same thing (at around the same time) this year, so saddle up. Decrease in Blogging - I still blog a lot, but there was a time when I'd crank out 4-5 entries a week. Now it's mostly 3 (with the occasional 4th, though also sometimes less), which has become a comfortable groove for me. I expected to continue in this manner in 2015, perhaps settling down into 2-3 entries a week (or less). An American Wild Year - Looking at my top 40, I'm struck by how many American Wild Ales show up (with the occasional Lambic or sour/funky Saison that might as well be an American Wild) and, conversely, how few Barrel Aged Imperial Stouts there were (Not that they're absent, but seeing as though they're my favorite style...) I think this probably has something to do with a strong local scene in Wild Ales, and just a few opportunities that came up. I find that my ability to acquire great beer tends to go in style waves, with 2014 being a whole lot of saisons and American Wilds. Right now, I'm predictiong 2015 will have a few more Stouts! Trading - In all honesty, I don't think I completed a single trade this year, though a few of the beers on the list below are from late 2013 trades. I still managed to get my hands on plenty of non-locally distributed beer and I anticipate this dry spell ending in the next couple months, but yeah, not a year for trading over here. Wales, bro - Not a ton of these this year either (and certainly not the true beer nerd walez), but a couple of personal white whales were slain this year, but those are stuff everyone's had before and for some reason had eluded me until 2014, like The Abyss or Saison Brett. And then there's emerging breweries like Sante Adairius or local wonders like Tired Hands, which I'm doing my best to keep up with. I see more of that happening this year as well, not so much with the insane wales, bro. Ratings Inflation - I mentioned this last year as well, but ratings inflation has continued unabated. Stuff I rated an A a few years ago often does not compare to the stuff I'm rating an A these days. The only exception is the A+ category, where I never rate anything (only 4 entries in the 4 years of the blog, and none in 2014). I think the point there is that I generally want to try a beer on multiple occasions and see if it stands up to the test of time, which is sometimes impossible (limited, one time only brews?) and also not conducive to stuff I've already reviewed. That being said, perhaps we'll have some upgrades in the year 2015. Stay tuned! Homebrewing - I've been terribly lazy this year. I started off pretty strong, with a batch of Fat Weekend IPA and an oak-aged barleywine, but since then, things have been pretty quiet on this front. In part, this has to do with my whole drinking down the cellar thing (a not insignificant amount of the beer down there is homebrew), but it's also definitely a laziness thing. I plan on revving back up soon enough. Aging/Cellaring Beer - Drinking down my cellar wasn't really part of my experiment with aging beer, more just a result of buying too much beer and unintentionally aging it. As with last year, I'm finding that aging is interesting, but rarely produces spectacular results. This bottle of 1.5 year old Tired Hands Only Void was spectacular, and I had a few other successes in 2014, but for the most part, I'm still finding that drinking beer fresh is your best bet. However, I do have some true experiments that I'm hoping to did into in 2015. I anticipate at least a few will be great. Well, after looking through that list, it seems I did have a rather fantastic year. Here's to 2015, already shaping up to be a good one. Firestone Walker's excellent barrel aging program essentially grew out of their Anniversary beers. For their first entry in that series, they brewed 4 different beers and aged them in 6 different barrels (yielding 10 lots to blend, as it was their 10th anniversary). Some of these have gone on to become standard annual offerings on their own, like §ucaba or Parabola, but some have only been released in minute quantities at the brewery itself (or perhaps the occasional beer week surprise). 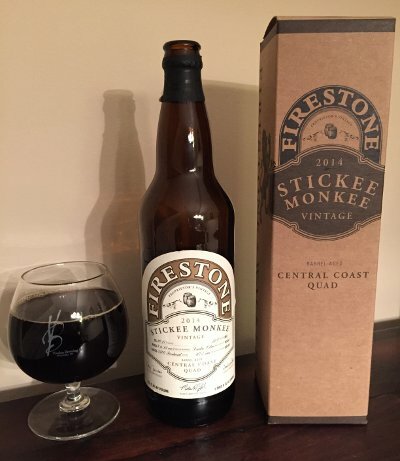 For the past few years, Firestone Walker has been releasing larger doses of individual components in one-off bottles, and Stickee Monkey was 2014's entry. Beer Nerd Details: 13.4% ABV bottled (22 ounce boxed bomber). Drank out of a snifter on 12/27/14. 2014 Vintage. Bottled 04/18/14. I will never tire of Firestone Walker's barrel aged beers, despite being somewhat difficult to procure using standard methods. Even their sours and wilds are starting to come along. Up next: Firestone XVIII (14% of which is actually Stickee Monkey, heh). After that, well, Firestone has said that Double DBA will no longer be bottled, setting the stage for some sort of replacement. To my knowledge, this has not been chosen yet, but I'm guessing Parabajava (a coffee infused version of Parabola, relatively new) or Bravo (BA imperial brown ale, been around since the beginning). In any case, I'll still be hunting down bottles of §ucaba and Parabola, because they're so reliably great. Beer Nerd Details: 7% ABV canned (12 ounce). 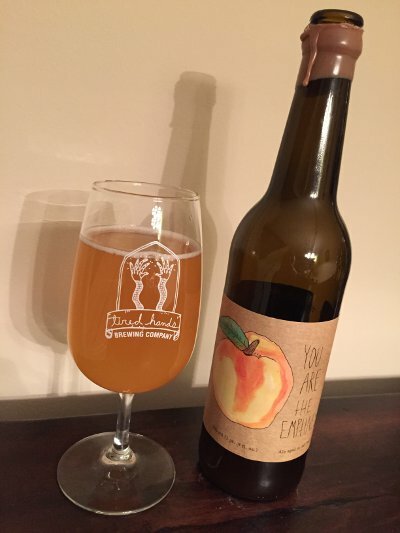 Drank out of a tulip glass on 12/24/14. 2014 Vintage. 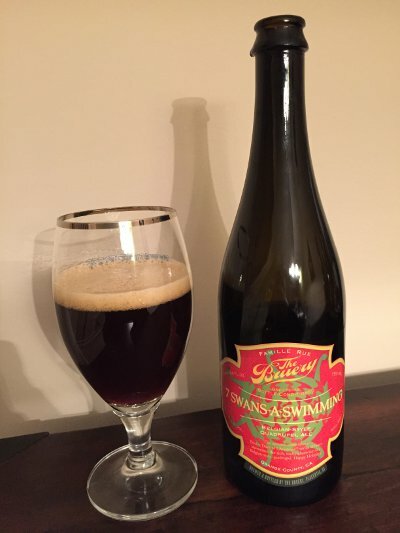 Samichlaus Barrique 2013 - Every Christmas Eve, I break open some vintage of Samichlaus as last minute wrapping fuel. Given the 14% ABV, it's amazing that I don't cut off a limb in a scissor mishap or label the presents wrong or something. I have vintages of this dating back to 2009, and of my experiments with aging, these have been among the best. 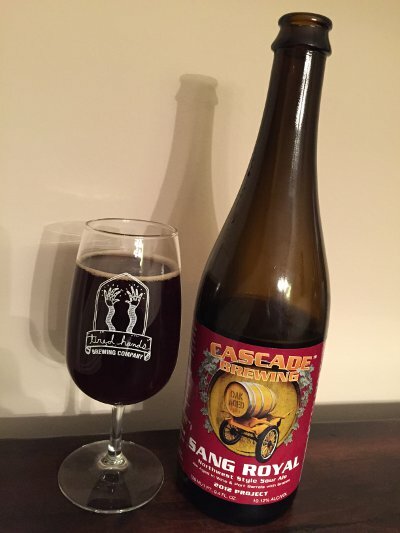 This year, though, I took a flier on the Barrique variant, which is the standard Samichlaus (what with its already long 10 month conditioning stage) aged in German wine barrels (apparently Chardonnay) for an additional 5 weeks. I wasn't quite sure how well this would work, but it turns out to be a really good idea. 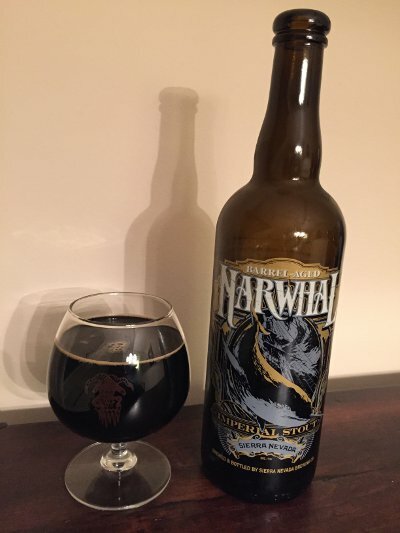 Pours a clear dark amber color with a bit of big bubbled head that quickly subsides. Smells of dark fruits, sticky sugar, and of course, booze. The taste is rich and sweet up front, lots of dark, vinous fruit flavors pepper the middle, and the booze hits pretty hard in the finish. The barrel character is not super strong, but I feel like it does take some of the bite out of the booze considering the young vintage (which is usually quite hot at this stage) and it contributes to a more well rounded mouthfeel. Speaking of which, this is rich, more carbonated than I remember from Samichlaus, but still very sticky, with a heaping helping of booze. Again, I feel like the barrel character maybe contributes a bit to the richness of the mouthfeel, though it's not a huge impact. In general, it feels like the barrel aging smooths out some of the sharp edges of young Samichlaus. B+ but I'm wondering if age will treat this even better than the standard stuff. Beer Nerd Details: 14% ABV bottled (750 ml capped). 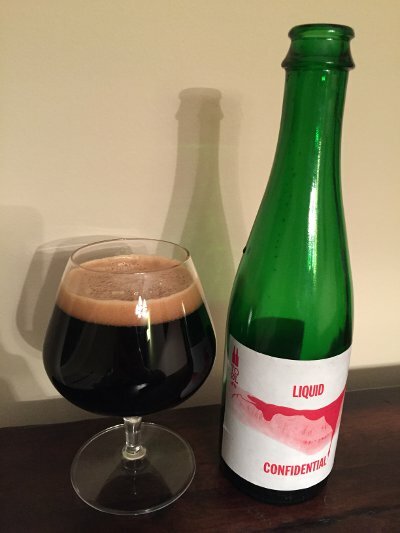 Drank out of a snifter on 12/24/14. 2013 Vintage. Beer Nerd Details: 7% ABV bottled (500 ml capped). 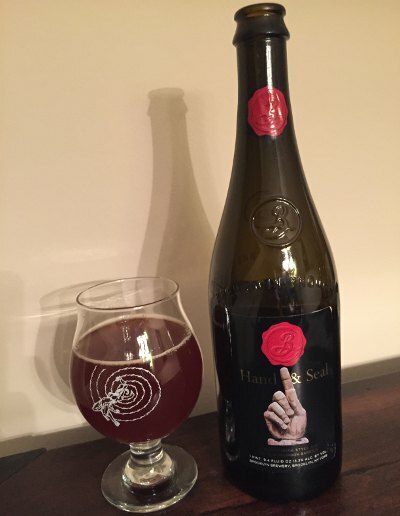 Drank out of a tulip glass on 12/25/14. Batch: 611. Total Bottles: 2280. Beer Nerd Details: 12.9% ABV bottled (750 ml caged and corked). Drank out of a snifter on 12/24/14. And there you have it. We shall move on to regular fare soon enough, but I'm already thinking about taking a break again this year, like I did last year. That will probably be a few months away at this point because I have some great beer incoming, so stay tuned. I prefer years one through three myself, depending on the hop and spice profile of the original vintage. Obviously, if there is more hop and spice to begin with, there will be more carryover from year-to-year as the product ages, but by year five they all pretty much taste the same. Not necessarily bad, but not very interesting either. 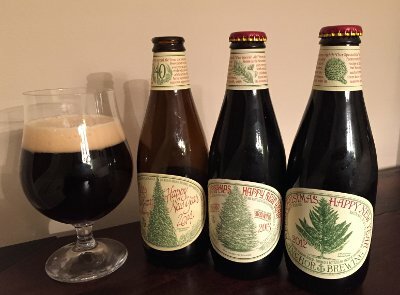 I did a ten-year vertical tasting of our Christmas Ales once and found that by year seven, they really all did taste the same - and frankly, not very good. I don't believe you Bob! In actuality, I do believe that, but I still want to see for myself. In the meantime, I'll follow Bob's advice and just look at the last three vintages to see what's up. Beer Nerd Details: 5.5% ABV bottled (12 ounce). Drank out of a tulip glass on 12/20/14. Overall, I still think the 2011 has been the best vintage I've tried so far, but 2014 took the honors tonight. I also suspect that it will age better than other recent vintages. Next year, I will technically be able to do a 5 year vertical, but I may want to wait a year or two before going too crazy (I should be able to do a 4 year vertical next year and still have enough 2012 to last another year or two). Per Bob, after 5 years, things apparently get samey, but who wants to believe that guy?! Happy Holidays everyone, see you next week! Brooklyn Hand & Seal - Pours a murky light brown color with a cap of short lived head. 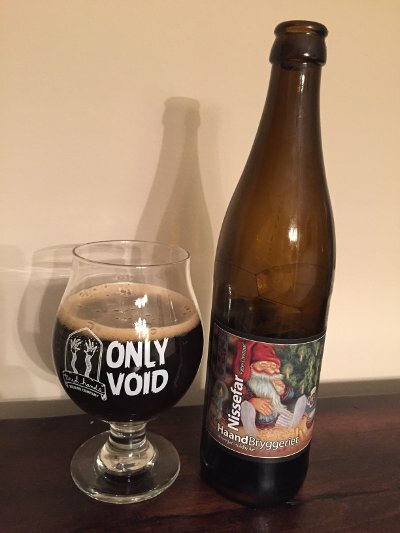 Nose has a lot of bourbon, maybe some fruity malt as well. Not a particularly strong nose, though. Taste is very nice. 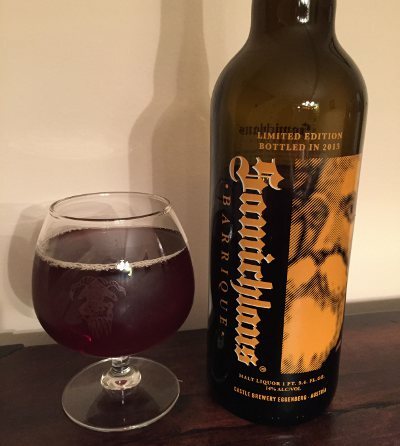 Lots of sweetness, rich caramel, toffee, dark fruits, bourbon, vanilla, and oak, all playing nice with one another. Mouthfeel is rich and creamy, moderate carbonation, full bodied, a little boozy and warming alcohol in the belly going on. Overall, we've got a very nice sipper of a beer, on style, well balanced and tasty. B+ but it's high on that scale, perhaps even an A- if I'm more generous. Beer Nerd Details: 13.3% ABV bottled (750 ml caged and corked). Drank out of a tulip glass on 12/20/14. Vintage 2014: Blend #1. It's been a while since I've sampled any Brooklyn brews, so this was a nice surprise. I've seen some bottles of Cuvee Noire out and about, so perhaps we'll see those here. Or perhaps not. Only time will tell. I was going to just make a Royale With Cheese joke and whine about the metric system, but as with the beer itself, DDB beat me to it by a few years. Instead I'll have to rely on pedantic translation backgrounding, like Sang Royal being French for "Royal Blood" and how popular it is to pretend that a given grape-based beverage is blood. Indeed, we're about the celebrate the birth of the guy who popularized the concept in just a few days. The last couple Cascade beers I've had wound up being a little disappointing. The Vine, another grape-based beer, was fine I guess, but not as sour or oaky as I've come to expect from Cascade (It tasted more like a tripel dosed with grape juice than a funky sour). The Blueberry had a slight case of the Smoketômes, which was clearly not doing it any favors. Given the expense of acquiring these bottles, I wasn't sure if this would be worth the stretch, but it's one of their better regarded beers (which is saying something) and it's not like I haven't had some great beers from them, so I rolled the dice and I'm glad I did. Beer Nerd Details: 10.12% ABV bottled (750 ml caged and corked). Drank out of a flute glass on 12/19/14. Vintage: 2012 Project. So Cascade certainly came through on this one. I'm sure opinions vary on the $25+ price tag, but it is phenomenal beer. A few more Cascades in the Kaedrin pipeline, including Bourbonic Plague and Figaro, coming early next year. One of the simultaneous strengths and weaknesses of American craft beer is its relationship to traditional style, or lack thereof. On the one hand, if it can be brewed, it's probably being brewed in America somewhere. Want a braggot? 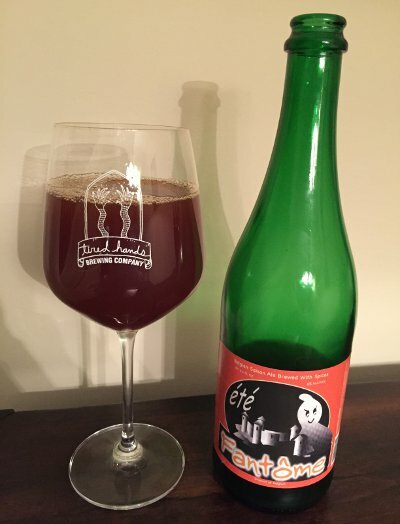 Sahti? Grätzer? Someone in America is keeping these obscure styles alive. Want a beer brewed with goat brains? We got you covered. On the other hand, who are we kidding? IPAs and Stouts are mainstays and they're where the buzz is at (I suppose sours can be included in that these days). And to be honest, it can get a bit tiresome to wade through all of the "off centerd", "genre-tilting", "innovative" beers that are continually being thrust our way. That goat brain beer? I think it's both awesome and a little gross that it exists. The Bruery is one of those breweries that straddles the line. They do some (more or less) traditional stuff, but then, they also like to put big twists on traditional styles. 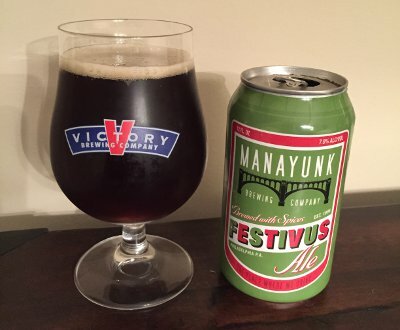 Their 12 Days of Christmas series, in which they release a new beer every year that is meant to last until the release of 12 Drummers Drumming (making for one heck of a vertical), started off with some traditional stuff. Partridge In A Pear Tree was basically a Belgian Strong Dark, 2 Turtle Doves was a little more adventurous, a sorta Belgian Porter made with cocoa nibs, toasted pecans, and caramelized sugar, and aged in bourbon barrels (seems to be the best received entry), 3 French Hens was another straightforward Belgian Strong Dark, but it was partially aged in French Oak, 4 Calling Birds was a sorta Belgian Winter Warmer (almost a stout, if I remember correctly), 5 Golden Rings went way off the reservation, being a Belgian Strong Pale Ale made with Pineapple juice (and, quite frankly, the worst in the series so far), 6 Geese A Laying returned to the Belgian Strong Dark formula, but incorporated Gooseberries. For the most part, this has been a series of diminishing returns and escalating weirdness (or "off centeredness" or "innovative" or whatever you want to call it). I've not had the first two entries, but they have decent reputations. The 3rd and 4th entries were quite nice. All the ones up to that point were pretty straightforward. The 5th was... not bad, per say, but not particularly good either, and that pineapple juice made it a little too weird. The 6th was better, but not quite up to par with the rest of The Bruery's output, and the gooseberries made it a little weird. And now we come to 7 Swans A Swimming, which returns to traditional brewing tactics land. It's basically a straight up Quadrupel, period. No weird adjucts or additions, just traditional Belgian Strong Dark beer. Not having had Partridge in a Pear tree, they seem similar, but I can't say for sure. So how does this fare? The Bruery 7 Swans-A-Swimming - Pours a dark brown color with hints of amber when held up to light and a nice finger or two of head. Smells nice, bready belgian yeast, spice, dark fruits, plums, and the like. Taste is also nice, lots of dark fruits, plums, a little raisin, plenty of yeast spice to cut through it. Mouthfeel is medium bodied, well carbonated (but not quite as perfect as top tier quads), and a little sticky in the finish. Overall, its a very nice, on-style take on the quadrupel. Drinking a whole 750 makes it feel a bit one note, and I feel like the complexity sorta fades as it goes, but it works nonetheless. I'll still give it a B, but it's a high B and I like it better than the last couple entries in the series (ratings inflation continues unabated). Beer nerd Details: 11% ABV bottled (750 ml). Drank out of a goblet on 12/13/14. Bottled 11/10/14. At some point, I thought it would be cool to save up all the 12 days of christmas beers for a big vertical (which is coming up fast), but I basically only have 4 Calling Birds in my cellar. This is the first time since then that I'm seriously considering grabbing another bottle for the cellar, even if it wasn't particularly spectacular (it seems like it could age well). I guess we'll see. Most of the time, when you're talking about beer aged in a wine barrel, you're talking about a sour beer. The wild yeast and souring bacterias seem to produce something that works harmoniously with the acid and tannin character of wine. My experience with non-sour wine barrel aging is somewhat more limited, but also quite variable. When it comes to red wine barrels, you've got something like Victory's Red Thunder, which was fine but unremarkable, and Dock Street's Barrel Aged Prince Myshkin RIS, which had a fabulous barrel character that didn't really give much red wine, but lots of oak and vanilla (unfortunately, also a distinct lack of carbonation, which really put a damper on things for me). Two very different beers (though in fairness, the Dock Street barrel was on its third use, which does make a difference).